Tariff Plan "Calls To All"
Migration to "Calls to all" tariff plan is not available. Subscribe to the tariff is available via activating the Starter package "Calls to all"
*In case of using the services during the 4-week bundle period but after the exhaustion of the provided certain type of the telecommunication services included in the bundle to the full extent. The melody of MeloRing service is included to the cost of starter package or to the conditions of tariff plan that you have changed to. The melody of MeloRing service is valid during 15 days (including the day of activation or migration to the tariff plan). After 15 days the MeloRing service will be automatically prolonged for 5 UAH/30 days. To switch off this service you need to send SMS with 0 to short number 5050 for free. If the MeloRing service has been switched off and in the case you have to change to another tariff plan you can switch it on again by calling 5050 or dialing *150#. Migration and subscription to "Calls to all" tariff plan is not available. If there are not enough funds on the account to pay for a 4-week service package, a daily service package for 2 days will be provided automatically (the day of providing + the next day till 11:59 p.m.). In case a subscribers has less than 10 UAH on their account, they are provided with the bundle of services for 2 days the price of which amounts to all available costs on the account, namely the minutes for lifecell numbers in the amount that equals to 1 minute for 1 kopeck. 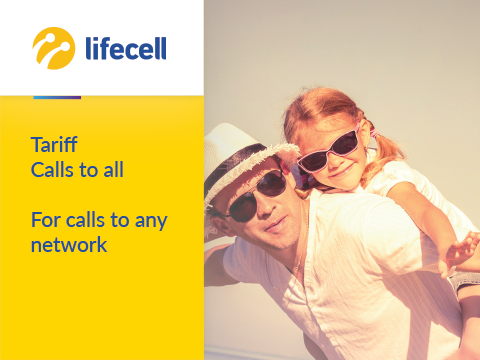 For example, if s subscriber has 6,00 UAH on their account, these funds will be charged and they will be provided with 600 minutes for calls to lifecell numbers within for 2 days. Providing a bundle of services on these terms is possible once during 8 weeks starting from the last payment of the cost of the 4-week bundle of services. Otherwise, the services are provided according to the standard tariffs. In the case of migration to another tariff plan, the paid 4-week bundle shall be kept. The tariff plan with abovementioned terms is valid throughout the whole territory of Ukraine starting from 17.05.2018. Providing of telecommunication services on the temporarily occupied territories and territories, where the governmental authorities temporarily or do not have full powers, can be limited or impossible due to the circumstances, which are beyond the operator's influence and control. 1"150 BONUSES on your account" means that 150 bonuses are included in the price of a subscriber's initial bundle of services. 1 bonus gives a right to receive extra services totally priced 1 UAH. After the activation of the initial bundle, 4-week bundle of services will be provided, and the bonuses that amount to the price of a corresponding bundle will be charged from the account. The remaining bonuses can be used during 60 days starting from the moment of activation of the initial bundle and receiving bundles of services and some other telecommunication services. 2The received bundle MB can be used in 4.5G network, 3G+ lifecell, and in EDGE (2G) network. The unused portion of the bundle is not accumulated and is not transferred to the next period. 3Starting from 101st SMS during the day, the price is equal to 1 UAH for each SMS. The tariff plan terms are valid from 13.02.2019. The tariff is quoted with all charges and commissions. This tariff plan is launched on — 17.05.2018. The minimum tariff plan duration is 7 days from the date of its launch. By activating this lifecell SIM-card, the user confirms that she/he reads and agrees to the Terms and Procedure of Telecommunication Services Provided by lifecell LLC, how to use the chosen tariff plan, has gotten all the required, available and reliable information about telecommunications services, their quantity, quality, range, as well as their provider (seller). LLC “lifecell” reserves the right to set and change tariffs (tariff plans) for its services in accordance with the Law “About Telecommunications”, to change the list of the services of such kind, as well as change the terms and conditions for them; change the period of Campaigns, prematurely terminate, stop their validation period unilaterally in accordance with conditions and procedures of providing the LLC “lifecell” telecommunication services.